The aim of this study was to better understand the relations between carbon and oxygen stable isotope values of ambient water, mollusc shells, macrophytes and their carbonate encrustations, commonly used in palaeolimnological studies. Water, molluscs and macrophytes were sampled from the littoral zone in Lake Lednica, NW Poland. The influence of carbon species assimilated during photosynthesis and the net intensity of photosynthesis resulting from the size of charophyte species and the density of their stands were postulated to be the most important factors causing the species-specific δ13C values of charophyte thalli and encrustations. It was suggested that photosynthetic activity of charophytes affected not only the δ13C values of charophyte encrustations but also mollusc shells by changing δ13C values of DIC within charophyte stands. In addition, incorporation of metabolic carbon into the shell was proposed as the main cause of both the 13C depletion of mollusc shells relative to δ13C values of DIC and the species-specific δ13C values of shells. Mollusc shells were precipitated at the isotope equilibrium or close to the equilibrium with δ18O values of lake water. Charophyte encrustations were found to be 18O depleted due to the kinetic isotope effects during intense photosynthesis and thus fast precipitation of the calcite. Numerous studies discussed the factors controlling carbon (δ13C) and oxygen (δ18O) stable isotope composition of freshwater carbonates, including mollusc shells or carbonates precipitated as a by-product of photosynthetic activity of autotrophs. For over a decade now, there has been an increasing number of isotope studies of charophytes (macroscopic algae from the Characeae family), in particular encrustations precipitated on the stems of those macroscopic algae (Coletta et al., 2001; Andrews et al., 2004; Pentecost et al., 2006; Pełechaty et al., 2010). Investigations of the isotope composition of freshwater mollusc shells have over 50-year history (e.g., Fritz & Poplawski, 1974) with the most recent studies focused on the detailed sclerochronological isotope record of mussel growth increments (e.g., Kaandorp et al., 2003; Schöll-Barna et al., 2012; Yoshimura et al., 2010). Attention was also paid to the δ13C values of macrophyte organic parts (Keeley & Sandquist, 1992; Leng et al., 2005). Determination of factors controlling the stable isotope composition of modern carbonates and organic matter makes the application of their δ13C and δ18O values possible in the studies of both recent lakes and lacustrine sediments. Oxygen stable isotope composition of mollusc shells and charophyte encrustations is primarily controlled by δ18O values of water and water temperature (Coletta et al., 2001; Kaandorp et al., 2003; Andrews et al., 2004; Shanahan et al., 2005). Many studies have demonstrated that mollusc shells tend to precipitate in isotopic equilibrium with water (Fritz & Poplawski, 1974; Dettman et al., 1999; Kaandorp et al., 2003; Anadón et al., 2010; Versteegh et al., 2010). In contrast, it was shown (McConnaughey, 1989; Andrews et al., 2004; Pentecost et al., 2006) that due to rapid photosynthesis observed in charophytes, precipitation of their encrustations is exposed to kinetic isotope effects. Kinetic isotope effects occur because the reaction rates of light isotopes are faster compared to the heavy isotopes. Discrimination against the heavy isotopes of carbon and oxygen during the hydration and hydroxylation of CO2 (McConnaughey, 1989) leads to decreased carbon and oxygen stable isotope values of carbonates, compared to δ13C values of DIC (dissolved inorganic carbon) and δ18O values of water. In contrast, kinetic isotope effects in mollusc shells are regarded as small or absent (McConnaughey & Gillikin, 2008). Comparison of δ18O values of molluscs and encrustations must consider 0.6‰ enrichment in aragonite shells compared to calcite encrustations (Tarutani et al., 1969), both precipitated in isotopic equilibrium with water. The primary factor responsible for the differences in the δ13C values observed in macrophytes is the source of carbon available for photosynthesis. In most freshwater lakes in temperate climate, the most frequent form of carbon occurring in water is HCO3 − as it dominates at pH values between 7 and 9.5. At decreased water pH, HCO3 − is accompanied and finally replaced by CO2, e.g., at pH 5.5, 80% of carbon occurs as CO2 (Stumm & Morgan, 2012). The difference between δ13C values of HCO3 − and aquatic CO2 is dependent on the water temperature and ranges between 7 and 12‰, with HCO3 − being 13C enriched (Mook et al., 1974; Romanek et al., 1992; Zhang et al., 1995). Because numerous aquatic macrophytes have the ability to use both carbon species, the δ13C value of tissue or thalli differs to a large extent. δ13C values reported for different aquatic plants range between −50 and −11‰ (Leng et al., 2005). Carbon stable isotope composition of charophyte thalli and encrustations is also controlled by photosynthetically driven metabolic effects (Andrews et al., 2004, and references therein). During photosynthesis, a higher proportion of 12CO2 is incorporated preferentially by charophytes to form 13C-depleted thalli. In consequence, the remaining DIC in the direct surrounding of the stems, i.e., in microhabitat, becomes 13C enriched. CaCO3 precipitated from such DIC is 13C enriched compared to δ13C values of DIC more distant from the stems (cf. Pentecost & Spiro, 1990; Andrews et al., 1997). In molluscs, both inorganic carbon derived from the ambient DIC and organic carbon originating from the mollusc food can be bound to form the shell. Because the δ13C value of the average organic matter in freshwaters is approximately 20‰ lower compared to the carbon stable isotope composition of DIC (Leng et al., 2005), the different proportion of the two carbon sources in the shell is subsequently reflected in its δ13C value. The amount of carbon derived from mollusc food was estimated at 6–10% of the total C built into the shell (McConnaughey et al., 1997); however, the exact percentage can differ between the species. Also, feeding habits of molluscs are important because δ13C values differ among macrophytes and phytoplankton, which are the primary sources of food to freshwater molluscs. δ13C values of the aquatic macrophyte organic matter were shown to vary between −50 and −11‰, and δ13C in lacustrine phytoplankton can range between −47 and −12‰ (Leng et al., 2005 and references therein). Thus, the food preferences of molluscs will result in the differences between the shell δ13C values. Another explanation of the differences between δ13C values of freshwater mollusc shells was proposed by McConnaughey et al. (1997) who noted a clear distinction between the δ13C values measured in aquatic gill-breathing snails and aquatic lung-breathing snails, with the former to have higher δ13C values and closer to δ13CDIC. McConnaughey et al. (1997) suggested that the low δ13C values in pulmonate snails result from their ability to breath 13C-depleted atmospheric CO2. Interpretation of the δ13C values of shells and encrustations must consider the different aragonite-HCO3 − and calcite-HCO3 − fractionation factors. The experimental laboratory study of Romanek et al. (1992) showed the temperature-independent 2.7 and 1‰ enrichment of aragonite and calcite, respectively, relative to HCO3 −. Temporal and spatial conditions of charophyte and mollusc growth must also be considered when interpreting δ13C and δ18O values. The length and starting point of macrophyte and mollusc growth and their habitat may all result in different isotope composition of thalli, tissues, encrustations, and shells. In most studies investigating the factors controlling δ13C and δ18O values of freshwater carbonates and organic matter, authors focused on the comparison between the stable isotope composition of encrustations, shells, macrophyte tissues or thalli and δ13C values of DIC and δ18O values of water (e.g., Coletta et al., 2001; Andrews et al., 2004; Pentecost et al., 2006; McConnaughey & Gillikin, 2008; Bucci et al., 2009; Pełechaty et al., 2010). However, equally important is understanding the relationship between the isotope composition of different components of the recent environment, as it helps choose the best material to be analysed isotopically in palaeolacustrine studies. Also, simultaneous isotope analyses of shells, encrustations and organic matter allow a more comprehensive reconstruction of the past environment because of the temporal and spatial differences in precipitation or growth of those materials. In the present study, we compared carbon and oxygen stable isotope values of ambient water, mollusc shells, macrophyte organic matter and carbonate encrustations of macrophytes (primarily charophytes), on which molluscs occurred. All the studied materials were sampled from the littoral zone of Lake Lednica, NW Poland (Fig. 1), a calcium-rich water body known for abundant and diverse charophyte vegetation (Pełechaty, 2005 and references therein; Pełechaty et al., 2015). An approach to include different components of the environment within the lake littoral into a comparative isotope study allows the determination of shifts in δ13C and δ18O values between the components and makes the interpretation of those shifts easier and more complete. Since it has been known that charophytes can strongly influence δ13C value of DIC and δ18O values of water in their direct surrounding (Coletta et al., 2001; Andrews et al., 2004; Pentecost et al., 2006; Pełechaty et al., 2010), the question was asked how this affects the stable isotope composition of mollusc shells, commonly attached to those macrophytes. Lake Lednica is situated in the southern part of the Gniezno Lake District, approximately 35 km east of the city of Poznań in west-central Poland (52°33′N, 17°23′E; Fig. 1). Lake Lednica is an elongated water body with an area of 3.4 km2 filling the southern part of a tunnel valley extending between Janowiec and Lednogóra. The lake is 7.3 km long and has a maximum width of 0.83 km; its maximum depth is 15.1 m. In addition to direct precipitation, limited surface run-off and groundwater input, the lake is fed by several small, temporary streams, which mainly flow during early spring and after the events of intense precipitation. One permanent surface outflow is located in the south-eastern part of the lake (Kolendowicz, 1992). The lake catchment is relatively small, with an area of approximately 38 km2. Due to the insignificant inflow in relation to the lake volume, ~2.4 × 107m3, the modern water residence time of the lake is relatively long and has been estimated at 6 years (Jańczak, 1991). This is consistent with an estimated annual water exchange of 18% (Tybiszewska & Szulczyńska, 2003). Physical and chemical properties of Lake Lednica waters, based on the summer values, indicate Secchi disc visibility on average more than 2.0 m, high oxygen saturation, solute content and high concentrations of Ca2+ above 115 mgl−1 (Pełechaty et al., 2015). The calcium-rich and hard meso-eutrophic waters of Lake Lednica feature a high diversity of charophytes (Characeae), dominant in the vegetation of the lake. Charophyte meadows, extensively developed in the littoral zone of the lake, offer a variety of habitats for the mollusc fauna and significantly contribute to the sedimentation of lake marl. Calcium carbonate represents up to 80% of the modern sediments deposited in the littoral of Lake Lednica. The study area is influenced by both Atlantic and continental air masses, the former commonly prevailing. The present climate is characterized by mean annual precipitation of 500 mm and mean annual temperature of 7.9°C (mean July 17.9°C; mean January −2.4°C). A seasonal precipitation minimum causes an effective moisture deficit in the summer months (Kondracki, 2000). Macrophytes with live molluscs attached were sampled within the littoral zone of Lake Lednica (Fig. 1) at a water depth between 2 and 7 m, at 1-m intervals. The sampling sites were set along a transect running perpendicular to the isobaths of the lake. Macrophytes were sampled with an anchor and placed in tight-sealed plastic bags. Along with macrophytes, water samples for carbon and oxygen stable isotope analyses of DIC (dissolved inorganic carbon) and water, respectively, were collected at a depth of 0.5 m and from the above-bottom water layer (directly above macrophyte stands) using a bathometer (5-l Uwitec Plexiglas Watersampler). Water samples were placed in 10 ml glass septa test tubes and preserved with mercury chloride (HgCl2). Separate vials were used for the collection of water for analysis of δ13C of DIC and δ18O of water. Basic physical and chemical analyses of water above the studied charophyte patches, including water temperature, oxygen concentration, conductivity and pH, were performed using a portable field measurement equipment (Elmetron CX-401). All the live molluscs present on macrophytes were handpicked in the laboratory and identified to a species level under a low-power binocular microscope (Zeiss Stemi 2000-C). Molluscs were treated with 50% ethyl alcohol for preservation until further treatment. Soft parts were handpicked with tweezers. All the empty shells were treated with 10% H2O2 for 48 h to eliminate organics that might influence the isotope results. Subsequently the shells were cleaned with a nylon brush under tap water and dried at room temperature overnight. Samples composed of 10 shells each (Table 1) were homogenized in an agate mortar and placed in Eppendorf vials. Selection of 10 shells per each sample results from within population variability in C and O isotope values observed in freshwater mollusc shells (Apolinarska, 2013; Apolinarska & Pełechaty, unpublished). In our studies, we have shown that mean isotope values of at least several, preferably 10 shells, are representative of δ13C values of DIC and δ18O values of water; however, species-specific offsets from equilibrium were observed. To avoid differences in the isotope composition of shells resulting from different age of particular individuals and hence differences in δ13C values of DIC and δ18O values of water during the shell growth, shells of uniform size within one species were selected for stable isotope analyses (Table 1). Also, all individuals with growth ceases visible on shells, indicative of winter cessation of the shell growth were excluded from the δ13C and δ18O analyses. Subsequent to the collection of the mollusc shells, the macrophytes were air dried and homogenized in an agate mortar. Each sample of macrophytes prepared for stable isotope analyses was composed of 10 individual specimens. Each homogenized macrophyte sample was divided in half. One half for stable isotope composition of carbonates was placed in Eppendorf vials. The second half of each sample was used for carbon isotope determinations in organic matter. The samples were acid-washed with 20% HCl for 2 h to remove carbonates and rinsed with distilled water. The procedure was repeated three times. Finally, the samples were oven dried at 50°C and ground to a homogeneous powder using an agate mortar. Fourteen water samples were analysed for δ13CDIC by an automated equilibration unit, Gas Bench II, coupled in continuous flow mode to a Delta V Advantage isotope ratio mass spectrometer at GeoZentrum Nordbayern, Erlangen, Germany. A sample volume of ~ 0.7 ml was injected into 12 ml Labco Exetainer™ vials which were prepared with phosphoric acid and pre-flushed with helium (purity 99.999%). Samples were analysed in duplicates and the reported value is the mean value. All values are reported in the standard δ-notation in per mil (‰) versus Vienna Pee Dee Belemnite (V-PDB) (Coplen, 2011). The datasets were corrected for the instrumental drift and normalized to the V-PDB scale by assigning a value of +1.95 and −46.6‰ to NBS 19 and LSVEC, respectively (Brand et al., 2014). External reproducibility was based on repeated analyses of a control sample prepared from sodium bicarbonate and DIC-free, ultrapure water. The precision of the control sample was better than 0.1‰ (1 sigma) for δ13CDIC. δ18O values of water were measured using an isotope ratio infrared spectroscopy (IRIS) analyzer, based on wavelength-scanned cavity ring-down spectroscopy, L 1102-i WS-CRDS, at GeoZentrum Nordbayern, Erlangen, Germany. All values are reported in the standard δ-notation in per mil (‰) versus Vienna Standard Mean Ocean Water (V-SMOW). Four sequential injections of each sample were measured, and raw data were corrected for sample-to-sample memory. The reported value is the mean value. The datasets were corrected for instrumental drift during the run and normalized to the V-SMOW/SLAP scale by assigning a value of 0‰ and −55.5‰ to V-SMOW2 and SLAP2, respectively (Brand et al., 2014). For normalization, two laboratory reference materials, which were calibrated directly against V-SMOW2, were measured in each run. External reproducibility, based on repeated analyses of a control sample, was better than 0.1‰. For a detailed description of the analysis procedure, refer to van Geldern & Barth (2012). The δ13C and δ18O values of 14 samples of molluscs, each consisting of 10 shells, and the same number of macrophyte carbonates were measured using a Gas Bench II hooked up to a Finnigan MAT 253 gas source mass spectrometer (both Thermo Fisher Scientific, Bremen, Germany) at the Institute of Geoscience at J.W. Goethe University in Frankfurt am Main, Germany. Details concerning the analytical setup are given in Spötl & Vennemann (2003). For a single analysis, 50–120 mg of carbonate was loaded into Labco Exetainer™ vials. Carrara marble was analysed with the samples, and its isotopic composition was calibrated against NBS 19 (Fiebig et al., 2005). The results are expressed as per mil (‰) deviations from the PDB carbonate standard and have an analytical precision of ± 0.06‰ for carbon and ±0.08‰ for oxygen. Organic carbon isotope (δ13Corg) determinations of macrophytes (14 samples, each consisting of 10 complete individuals) were measured using a Flash Elemental Analyzer 1112 connected to the continuous flow inlet system of a MAT 253 gas source mass spectrometer at the Institute of Geosciences, Goethe University Frankfurt, Germany. All values are reported in the standard δ-notation in per mil (‰). USGS 24 standard was analysed along with the samples in order to prove the accuracy and precision. Both samples and standards reproduced within ±0.2‰. Oxygen stable isotope composition of surface and above-bottom water (mean values −3.89 and −3.97‰, respectively) and carbon stable isotope values of surface DIC (mean −4.48‰) were uniform within the sampling sites in the littoral zone of Lake Lednica (Table 2; Fig. 2). The variability in isotope values was almost within the analytical error. A shift was observed only in the δ13C values measured in the above-bottom DIC. The δ13CDIC values decreased from −4.38‰ at a water depth of 2 m to −8.86‰ at a depth of 7 m (Fig. 2). Along the study transect, the littoral zone vegetation was dominated by charophytes. Chara tomentosa L. and Chara contraria Kütz. were present at a depth between 3 and 5 m. In deeper stands, Nitellopsis obtusa (Desv.) J. Groves was the dominant species, while the moss species, Fontinalis antipyretica L., was present at a depth of 2 m (Table 3). Both δ13C and δ18O values of encrustations occurring on macrophytes revealed a decreasing tendency along with an increasing water depth (Fig. 3; Table 3). δ13C values ranged between −2.77 and −10.23‰ and δ18O values decreased from −5.05 to −6.83‰. Carbon stable isotope values of the macrophyte organics revealed a trend similar to the δ13C values in carbonate encrustations of those macrophytes but were strongly 13C depleted (Table 3; Fig. 3). The highest values were measured in C. tomentosa (−19.4‰), while the lowest in N. obtusa (−34.3‰). Low δ13C values were also observed in F. antipyretica (−32.5‰). Populations of molluscs occurring on macrophytes within the littoral zone of Lake Lednica were dominated by Dreissena polymorpha (Pallas) with Bithynia tentaculata (Linnaeus), Radix auricularia (Linnaeus), Physa fontinalis (Linnaeus). Other gastropod species were also present; however, only a few shells were collected. Species composition and mollusc abundance changed with the depth (Fig. 1; Table 2). The molluscs, including D. polymorpha, B. tentaculata and R. auricularia, were most numerous at 3 and 4 m of depth and occurred on both charophyte species growing at this depth, C. contraria and C. tomentosa. P. fontinalis was collected from charophytes with delicate stems, i.e., C. contraria and N. obtusa, at greater depths. This snail was most abundant at 6 m. In contrast, the most diverse mollusc assemblage was found on F. antipyretica at 2 m of depth. The shells of D. polymorpha, the only mollusc species present throughout the studied depth gradient, became 13C and 18O enriched with increasing water depth (Table 1; Fig. 3). Although δ18O values measured in snail shells varied between the analysed mollusc species, they followed the 18O enrichment recorded by D. polymorpha. (Table 1; Fig. 3). The difference in the δ18O values between the species was usually below 0.5‰. The increased difference in δ18O values was noted between the shells of D. polymorpha and P. fontinalis (mean 0.74‰). The differences in δ13C values between the species were higher, up to 6.6‰. Moreover, the species could be arranged from the least to the most depleted of 13C: D. polymorpha, B. tentaculata, R. auricularia and P. fontinalis (Fig. 3). Offsets in δ13C values between the species were similar at all depths sampled, except for the δ13C values in the shells of D. polymorpha at a depth between 5 and 6 m (Table 1; Fig. 3). Very uniform δ18O and δ13C values of surface and above-bottom water and surface DIC, respectively (Table 2; Fig. 2), indicate spatial homogeneity of the isotope composition of the lake waters. This homogeneity indicates an active mixing of the water column within the littoral zone in Lake Lednica. However, isotope homogeneity was not observed for δ13C values of the above-bottom DIC. While at a depth between 2 and 6 m, the difference between the surface and above-bottom δ13CDIC was still relatively small, i.e., within 1‰, it increased strongly at the deepest site investigated (Fig. 2). This difference, increasing with depth, can be explained by an increasing amount of isotopically light carbon (12C) from decomposition of organic matter on the lake bottom. This observation indicates that the degree of water mixing by the wave action was limited at a depth of 7 m and below. This is confirmed by the findings of Pełechaty (2005) who has shown abrupt changes in the physical and chemical properties of the water in Lake Lednica starting at a depth of 7 m. Significant deforestation of the catchment area is conducive to good mixing of waters in the lake (Pełechaty, 2005). The still small difference between δ18O values of the surface and the above-bottom water at 7 m is in contradiction with the decreased δ13C values of DIC. The limited water mixing at this depth would increase the difference between δ18O values of the surface and the above-bottom water due to the preferential evaporative loss of H 2 16 O from the surface waters. However, it is suggested that depending on the strength of the factors affecting δ13CDIC and δ18Owater, the isotope values change more or less instantly and to a varying extent. Since the release of 12C-depleted CO2 from the decomposition of the organic matter on the lake bottom can be intense under dense macrophyte patches, as in the present study, the change in δ13CDIC values is significant (Fig. 2). The stable isotope composition of the waters in Lake Lednica described above is confirmed by the earlier studies performed in this lake (Apolinarska, 2013; Apolinarska & Pełechaty, unpublished). Carbon stable isotope values of DIC and oxygen stable isotope values of water remained nearly stable in the surface waters and δ18O values were also nearly constant in the above-bottom waters (depth of 0.5–7 m) in late spring (June) and mid-summer (August). δ13C values of the above-bottom DIC were still uniform in late spring; however, similarly to the present study, the decrease in δ13CDIC with increasing water depth was observed in summer. The 13C-depleted values of the above-bottom DIC were followed by a decrease in δ13C values of both the macrophyte organic matter (in this study in F. antipyretica tissues and charophyte thalli) and encrustations occurring on the macrophytes (Fig. 3). Whereas both the charophyte thalli and encrustations became 13C depleted with depth, their isotope relation to the ambient DIC was opposite. The organic parts were 13C depleted relative to δ13CDIC, whereas 13C enrichment in relation to δ13CDIC was noted in most of the encrustations Fig. 3). Both are related to the preferential 12CO2 incorporation by macrophytes during photosynthesis and formation of 13C-depleted thalli. This leaves the remaining DIC in the direct surrounding of the stems, available during CaCO3 precipitation, 13C enriched (Pentecost & Spiro, 1990; Andrews et al., 1997; Andrews et al., 2004, and references therein). Carbon stable isotope values of charophyte encrustations were commonly found higher compared to δ13C values of DIC (Coletta et al., 2001; Pentecost et al., 2006; Pełechaty et al., 2010). The extent of the 13C enrichment of the encrustations relative to δ13CDIC values must be corrected by 1‰ resulting from the calcite-HCO3 − fractionation factor (Romanek et al., 1992). In the present study, this brings most of the encrustations closer to δ13CDIC. As evidenced in the present study, the difference between δ13C values of charophyte encrustations and organic parts appears to be species-specific, i.e., about 24‰ in N. obtusa followed by about 21‰ in C. contraria and about 16‰ in C. tomentosa (Fig. 3). Those species-specific offsets in δ13C values between organic matter and encrustations indicate strong control of the macrophyte over the carbon stable isotope composition of its thalli and encrustations. It is suggested that the extent of the above-observed differences is related to the size of the charophyte species and the density of the stands it forms. Among the three species studied, C. tomentosa is the largest species, with the thickest stems. In conditions of intensive photosynthesis in dense charophyte stands, such as those formed by C. tomentosa, the local shortage of DIC available to these macroalgae may occur. In such a situation, the algae are less selective in carbon isotopes and more 13C is built into charophyte stems. Still, this intensive photosynthesis in dense charophyte stands leads to strong 13C enrichment of the local, i.e., within a stand, DIC. In consequence, high δ13C values of encrustations are observed. Less intensive photosynthesis in C. contratia, a smaller and less heavily encrusted species, is reflected in lower carbon stable isotope values in both encrustations and organic matter. C. contraria derived from the same depths as C. tomentosa had 5.5‰ lighter thalli and 0.5‰ lighter encrustations. In the present study, the greatest difference between the thalli and encrustations was found for N. obtusa. Furthermore, while encrustations of C. tomentosa and C. contraria were 13C enriched relative to δ13CDIC, encrustations of N. obtusa were 13C depleted relative to DIC (Fig. 3). N. obtusa is a smaller and ecorticate species producing less carbonates than Chara species (Pukacz et al., 2014). Because its growth is slower, the preferential uptake of H12CO3 − for photosynthetic purposes was not modified by the shortage of the carbon source suggested above for C. tomentosa. Also, N. obtusa was found at greater depths within the littoral zone of Lake Lednica, where, as discussed earlier, release of 12C-enriched carbon from decomposing organic matter results in 13C-depleted DIC. The lower the δ13C values of the DIC available to the macrophytes, the more 13C depleted the tissues and the thalli are. Low δ13C values will also be measured in encrustations. Similar correlation between the size of the charophyte species and δ13C values of its thalli was also made in charophytes sampled from five lakes in western Poland (Pełechaty et al., 2010; Pronin et al., unpublished). In these studies, encrustations of Chara rudis and C. tomentosa (both tall charophyte species with thick stems) were 13C enriched compared to DIC, whereas Chara globularis (small species with thin stems) encrustations were 13C depleted (Pelechaty et al., 2013a, b; Pronin et al., unpublished). The difference between δ13C values of encrustations and organic parts was even greater in the analysed moss species, F. antipyretica, compared to the analogue difference in charophytes (Fig. 3). Tissues of the moss were also far more 13C depleted relative to δ13C values of DIC (Fig. 3). We suggest that the low δ13C values measured in F. antipyretica (Table 3) are indicative of CO2 as the carbon source to this moss species, whereas 13C-enriched thalli of charophytes indicate HCO3 − as the main source of carbon assimilated by those macroalgae during photosynthesis. Depending on the water temperature CO2 is between 7 and 12‰ 13C depleted relative to HCO3 − (Mook et al., 1974; Romanek et al., 1992; Zhang et al., 1995). Assimilation of CO2 in addition to HCO3 − is also suggested for N. obtusa. At deeper sites where this species occurred (Fig. 3), the proportion between CO2 and HCO3 − was different compared to the shallower sites, due to lower pH, and more CO2 is available to the macrophytes. 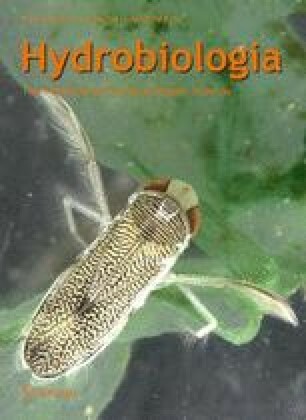 Because of the discontinuous presence of the macrophyte species along the investigated transect, F. antipyretica, in particular (Fig. 3), interpretation of the differences between δ13C values of macrophyte organic parts, encrustations they precipitated and DIC of their surrounding environment was limited in the present study. The above listed differences were studied in detail on two charophyte species, C. tomentosa and C. globularis, sampled from several lakes in western Poland (Pronin et al., unpublished). To verify whether the offsets are constant irrespective of the environmental characteristics, lakes with different physical and chemical properties, different in size and depth, were selected for the study. Similarly to the results of the present study, the difference between δ13C values of organic parts, carbonates and DIC were observed by the above-cited authors to be species-specific. δ13C values of C. tomentosa encrustations were by 16‰ 13C enriched relative to thalli, on average. The same difference was observed in this study (Fig. 3). Although Pronin et al. (unpublished) did not investigate C. contraria, they studied a similar in size charophyte species, C. globularis. Interestingly, encrustations of both species were 21‰ 13C enriched compared to organic parts, on average. The above presented comparison of data indicates that the differences in δ13C values discussed are species specific and relatively constant irrespective of the lake. This is further discussed by Pronin et al. (submitted). The extent of the offset between δ13C values of encrustations and organic parts is dependent on the charophyte size. Because mollusc was collected from the macrophytes, the common pool of DIC was available during precipitation of both the shells and the carbonates occurring on the macrophytes. The assumed common pool of DIC is also based on the similar time of growth of charophytes and molluscs studied. The majority of aquatic macrophytes, occurring in lakes in temperate climate, including many charophyte species, are annual (discussed in more detail below). Growth starts in spring and continues till autumn, when they gradually decay. However, among charophyte species studied here, C. tomentosa and N. obtusa are perennial species and, although with significant limitation, continue their development during winter. C. contraria is claimed to be an annual charophyte but can overwinter under favourable conditions. The common water moss (F. antipyretica) is also expected to perform a perennial growth pattern. Despite the above, however, our earlier studies in Lake Lednica evidenced significant reduction in vegetation cover during winter with the most pronounced increase in growth between May and July, particularly in case of charophytes (this being also observed in other lakes and by other authors, e.g., Pelechaty et al. 2013a and references therein). Most of the freshwater gastropods inhabiting temperate climate have a 1 to 2-year life span (Frömming 1956; Taft et al., 2012). D. polymorpha was observed to live up to 7 years (Stańczykowska & Lewandowski, 1993). After hatching, which is usually observed in May and June, molluscs live attached to macrophytes until autumn when macrophytes decay. In winter, molluscs live on the lake bottom, usually among plant detritus. To avoid differences in mollusc life span, shells of uniform size within one species, with no growth ceases visible on shells, indicative of winter cessation of the shell growth, were selected for stable isotope analyses in this study. Also, because of the small sizes of the species studied, migration of the gastropods, if present, is regarded to be restricted. However, despite the assumed common pool of DIC, δ13C values of the mollusc shells were 13C depleted relative to δ13C values of encrustations (Fig. 3) which is consistent with the isotope records of past environments (von Grafenstein et al., 2000; Yu, 2000; Hammarlund et al., 2003; Apolinarska & Hammarlund, 2009; Andersson et al., 2010). This 13C depletion of shells indicates either a different carbon pool used during precipitation, existence of vital effects or other isotope fractionation mechanisms influencing the stable isotope composition of shells. Interpretation of the δ13C values of shells and encrustations must consider different aragonite-HCO3 − and calcite-HCO3 − fractionation factors (Romanek et al., 1992). Correction of the δ13C values of the aragonitic mollusc shells and calcite encrustations by 2.7 and 1‰, respectively, brings most of the encrustations closer to δ13CDIC values, whereas it results in even a larger difference between δ13C values of mollusc shells and both encrustations and DIC (Fig. 3). Despite this general 13C depletion of the shells, carbon stable isotope values of molluscs were species specific (Fig. 3). The order of the species from isotopically heaviest to isotopically lightest, i.e., D. polymorpha, B. tentaculata, R. auricularia and P. fontinalis, confirmed the results of our previous study where stable isotope composition of the shells of several snails from the littoral zone of Lake Lednica was compared (Apolinarska & Pełechaty, unpublished). The species-specific δ13C values in freshwater mollusc shells were also observed by Fritz & Poplawski (1974), Aucour et al., (2003), Shanahan et al. (2005), De Francesco & Hassan (2013). The most plausible explanation of both 13C depletion of mollusc shells relative to δ13C values of DIC and the species-specific δ13C values in shells is linked with the proportion between ambient and metabolic carbon incorporated into the shell and δ13C values of the mollusc food. Among the studied molluscs, the most 13C-enriched shells were found in D. polymorpha, the only species using filter feeding as an exclusive feeding mode. Filter feeding is also among the possible feeding alternatives of B. tentaculata, the snail with the δ13C values intermediate between D. polymorpha and the two prosobranchs studied, i.e., R. auricularia and P. fontinalis. Although the δ13C values of particulate organic matter (POM) in Lake Lednica were not measured, it is suggested that the POM filtered by D. polymorpha and B. tentaculata could have been 13C enriched. At high pH values, as those measured in the surface waters of Lake Lednica (> 8, Pełechaty et al., 2015), HCO3 − is the main carbon species in the waters and thus the primary source of carbon for phytoplankton. Because the δ13C values of HCO3 − are about 9–10‰ higher compared to the δ13C values of CO2 in Lake Lednica, also higher δ13C values will be observed in phytoplankton (Talbot & Johannessen, 1992), which is regarded as one of the main constituents of the POM in epilimnion of lakes. Carbon stable isotope values of most of the studied molluscs follow the changes in δ13C values of encrustations, macrophyte organic matter and DIC, and become 13C depleted with water depth (Fig. 3). D. polymorpha is the only exception, with δ13C values of the shells increasing along the depth gradient (Fig. 3). The approximately 1‰ increase in δ13C values of D. polymorpha shells is considered as an additional proof of the influence of the metabolic carbon on δ13C values of its shell. The composition of the POM available for filter feeding organisms changes within the water column in a lake. At shallower depths, the POM is composed mainly of primary producers, i.e., phytoplankton, algae, whereas at increased water depths, the percentage of organisms from higher trophic levels, i.e., zooplankton, increases. Approximately 1‰ increase in the δ13C values is observed between each trophic level (DeNiro & Epstein, 1978; Vander Zanden, 2001). Because D. polymorpha is a filter feeder, the type of food ingested by this species changes with depth, which is reflected in δ13C values of its shell. In contrast to D. polymorpha, P. fontinalis, a small snail with thin, delicate shells, was the most 13C depleted among the studied molluscs (Fig. 3). In addition to diatoms, other algae, including charophytes, are the primary source of food for this snail. In the littoral zone of Lake Lednica, P. fontinalis was found exclusively on C. contraria and N. obtusa, smaller, the less heavily encrusted charophytes with lower δ13C values of their thalli, compared to C. tomentosa. Other mollusc species did not show such preferences. We suggest that feeding on C. contraria and N. obtusa was a reason of the most 13C-depleted shells of P. fontinalis among the species studied. The clear distinction between the δ13C values measured in aquatic prosobranch snails and aquatic pulmonate snails, as proposed by McConnaughey et al. (1997), was observed in the present study. Shells of the gill-breathing molluscs, B. tentaculata and D. polymorpha, were 13C enriched compared to the lung-breathing snails, R. auricularia and P. fontinalis (Fig. 3). Despite the above conformity, we are sceptical to apply this explanation here. P. fontinalis sampled from Lake Lednica was a fully aquatic species, occurring at the depths of 5 and 6 m, and thus, the possibility of active migration to the water surface was excluded. A similar conclusion was drawn for R. auricularia. Although this species was found at shallower depths compared to P. fontinalis at all the sites sampled, i.e., between 2 and 4 m, macrophytes to which the snail was attached were fully submerged. The life cycle of charophytes is depending on the species, annual or perennial and is mainly controlled by the local climatic conditions (Martin et al., 2003). During our previous field studies in Lake Lednica, most charophytes were absent in early spring, and thus, they were regarded to have an annual life cycle in this lake. Mollusc shells studied here were also regarded to have precipitated in the year of collection, as already explained above. Despite the similar growth period of charophytes and molluscs, and thus precipitation under similar water δ18O values and water temperature, δ18O values of encrustations and shells were different (Fig. 3). The increased oxygen stable isotope values of mollusc shells observed along the increasing water depth were accompanied by the decreased charophyte δ18O values (Fig. 3). Due to those different trends, the offset between the two carbonates was not systematic and ranged between 1 and 4‰. 18O-enriched values of mollusc shells compared to charophyte CaCO3 (Fig. 3) are consistent with the stable isotope compositions described in previous studies (von Grafenstein et al., 2000; Yu, 2000; Hammarlund et al., 2003; Hodell et al., 2005; Apolinarska & Hammarlund, 2009; Andersson et al., 2010). where δ18OARAGONITE (V-PDB) is the oxygen stable isotope composition of the aragonite mollusc shell and δ18O of water (V-SMOW) is subtracted by 0.2‰ to relate to the V-PDB standard (Wurster & Patterson, 2001). where δ18OCALCITE is the oxygen stable isotope value of calcite encrustation and δ18OWATER is the oxygen stable isotope composition of water. Because the δ18O value of water was measured in the present study only once (water was sampled in July along with macrophytes and mollusc), δ18OWATER used in Eqs. 1 and 2 was derived from the previous, detailed study of the physical, chemical and isotopic properties of waters in Lake Lednica, with the samples collected at monthly intervals (Pełechaty & Apolinarska, unpublished). According to the aforementioned previous study, δ18O values of water in Lake Lednica changed from approximately −4.7 to −4.0‰ between May and July (approximate growth time of investigated shells and encrustations), with the mean value of −4.3‰, which was applied in calculations. We decided to use those previously measured values because δ18O values of water sampled in July were consistent in both studies. Mean temperature of precipitation of the snail shells calculated using the equation of Grossman & Ku (1986) ranged between 20.6 and 17.8°C and decreased with the lake depth (Fig. 4). Such temperatures are consistent with the mean water temperatures measured in the littoral zone of Lake Lednica between May and July (Pańczakowa, 1991; Fiszer & Michałkiewicz, 1998; Pełechaty, 2005; Pełechaty & Apolinarska, unpublished). Hence, the snail shells precipitated at the isotope equilibrium or close to the equilibrium with water, which is consistent with conclusions of the previous isotope studies of mollusc shells (Fritz & Poplawski, 1974; Leng et al., 1999; Dettman et al., 1999; Wurster & Patterson, 2001; Wu et al., 2007). Lower temperatures of shell precipitation calculated for D. polymorpha (Fig. 4) indicate an earlier start of the growth of this species in the spring. This refers particularly to the D. polymorpha shells sampled at 5 m and below where the calculated precipitation temperature (14.2–15.5°C) is lower by approximately 3–3.5°C compared to the calculated precipitation temperature of P. fontinalis shells (Fig. 4). At the earlier start of D. polymorpha growth, the δ18O values of shells would have also been influenced by lower δ18O values of water. In consequence, the actual difference in the temperature of shell precipitation by the snails and the bivalve should be even higher. We suggest that small differences in the time of the species growth, or other vital effects not defined here resulted in the differences in δ18O values between the species. In all cases, the estimated precipitation temperatures of encrustations are higher compared to the temperatures of mollusc shell precipitation (Fig. 4). We interpret this difference as a result of the kinetic isotope effects during fast precipitation of biogenic carbonates, leading to decreased oxygen stable isotope values of carbonates compared to δ18O values of water (McConnaughey, 1989). Kinetic effects are well recognized in charophyte encrustations (McConnaughey, 1989; Andrews et al., 2004; Pentecost et al., 2006) but they are regarded to be small or absent in molluscs (McConnaughey & Gillikin, 2008). The decreased δ18O values in encrustations result in higher temperatures calculated (compare Eq. 2). Among the studied macrophytes, the estimated precipitation temperatures of encrustations sampled from F. antipyretica (the moss species) were consistent with the temperatures calculated for mollusc shells precipitation, and those carbonates are regarded to precipitate in isotopic equilibrium with water. However, this conclusion needs to be confirmed by further isotope study because it is based on the results of a single isotope measurement of F. antipyretica encrustations (Fig. 4). The strongly increased estimated precipitation temperatures of C. contraria and N. obtusa encrustation, at a depth below 5 m (water temperatures as high as 28°C were calculated; Fig. 4), are unrealistic in the littoral zone of Lake Lednica. Also, those temperatures are opposite to the expected decrease in the water temperature with depth, recorded in mollusc shells (Fig. 4). 18O depletion in the encrustations (Fig. 3), resulting in high temperatures calculated (Fig. 4), cannot be linked with kinetic isotope effects, because those effects are expected to be stronger at shallower stands where photosynthesis is more intensive due to higher light availability. Also, it is unlikely that kinetic isotope effects would have been stronger in N. obtusa compared to C. tomentosa. As suggested earlier, the latter species is a taller, thicker charophyte, and subsequently more intensive photosynthesis and stronger kinetic effects are expected in C. tomentosa. In the second, more likely explanation, lower than expected δ18O values of encrustations are linked to the earlier start of the growth of the charophytes in conditions with lower δ18O values of water. We suggest that the charophytes from deeper stands survived winter and thus recorded lower δ18O values of water. This interpretation is confirmed by 13C-depleted encrustations of N. obtusa. In the present study, we have shown the discrepancies between the carbon and oxygen stable isotope composition of water, DIC, macrophyte carbonates and organics, and mollusc shells sampled from the littoral zone of charophyte-dominated Lake Lednica, Poland. Isotope values were found to be species specific in macrophytes, both carbonate encrustations and thalli or tissues, and in the mollusc shells. Discussion of the factors controlling the stable isotope composition of the materials studied allowed the determination of factors responsible for the differences in the observed isotope values. The species-specific differences in δ13C values of macrophyte thalli or tissues and co-occurring encrustations were controlled by the species of carbon assimilated during photosynthesis, i.e., the proportion between CO2 and HCO3 − assimilated, and the intensity of photosynthesis. The latter modifies the local δ13C values of DIC and influences δ13C values of both encrustations and shell of molluscs attached to macrophytes. Discrepancies between the δ13C values of mollusc shells were regarded to be controlled by preferences of the species for the food source and the amount of organic carbon built into the shell. Oxygen stable isotope values of mollusc shells were found to be precipitated in equilibrium with δ18O values of water, or close to the equilibrium. δ18O values of encrustations were modified by kinetic effects resulting from fast photosynthesis in charophytes, whereas the δ18O values of carbonates precipitated on F. antipyretica (the moss species) were consistent with the values measured in mollusc shells and were regarded to precipitate in isotopic equilibrium with water. Based on the low δ18O values recorded in charophyte encrustations sampled from the water depth of 5 m and below, it was suggested that charophytes may survive winter at the deeper stands, i.e., may be perennial. The complexity of the factors controlling δ13C and δ18O values of macrophyte carbonates and organics, and mollusc shells sampled from the littoral zone of the lake and the differences in the observed isotope values stress the need for careful selection of the material for palaeolimnological investigations where δ13C and δ18O values in carbonates and organic matter are commonly measured. Because interpretations in the present study are based on dataset of one transect from one lake only, there is a need for further investigation and verification of the results obtained, which is planned for Lake Lednica and other Chara-lakes in the region. The researches were financially supported by Polish Ministry of Science and Higher Education, Iuventus Plus Programme, Grant No. IP2011 000471. We are grateful to two anonymous reviewers for detailed comments on the manuscript that allowed for improvements in data presentation and interpretation.